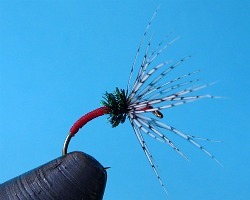 The Sakasa Kebari, or reverse hackle fly is probably the iconic "tenkara fly." 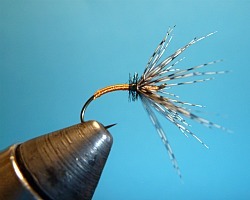 Dr. Ishigaki's fly is a variant, using rooster hackle rather than the more traditional hen pheasant soft hackle feather. I generally tie the sakasa kebari with partridge. Partridge feathers wrap well, they're the right size, and on one skin you get both brown and grey feathers. 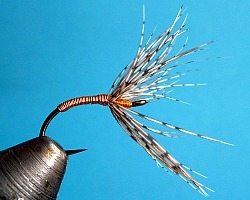 I am struck by the similarity of the Japanese sakasa kebari and the Italian pesca mosca Valsesiana flies. 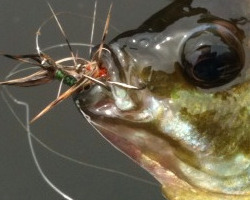 Both have reverse hackles, and both flies are "worked" or "manipulated" when they are fished. 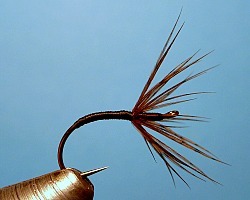 The reverse soft hackle pulses as the Japanese use their "invitation" technique and as the Italians "dibble the top dropper." In both cases, the slight motion of the hackles gives the impression of life, which can be much more effective than a plain "dead drift" presentation. The pesca mosca Valsesiana flies are also somewhat similar to the North Country style of soft hackle flies, although they are more heavily hackled, tied on curved rather than straight shank hooks, and often use silk floss rather than silk thread for their bodies. Like the Valsesian flies, Sakasa Kebari are hackled much more heavily than the North Country flies. I think that is a key design element. 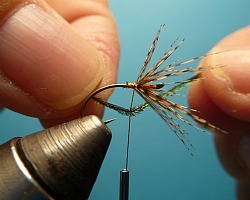 The sparse hackles of North County flies will fold back along the hook shank when the fly is worked. 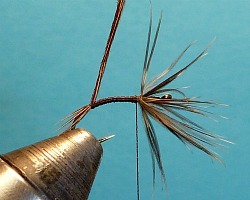 The hackles of the Sakasa Kebari open up rather than fold down when the line is pulsed. The hackle shape, and the heavy hackle, act like a sea anchor or drogue chute (an underwater parachute), resisting the pull of the line. 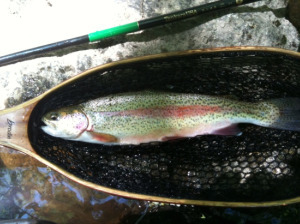 That helps minimize line sag and allows a tenkara angler to keep his line tighter and off the water's surface. Actually, I believe that is the primary reason for the reversed hackle. The Italian Valsesiana and the Japanese tenkara both utilize long rods with light lines tied to the rod tip. 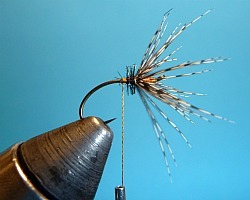 I do not believe that it is coincidence that anglers in both counties developed reverse hackle flies by coincidence. I think the rod, the line and the fly act together as a system, with the reverse hackle shape being an integral part of that system. 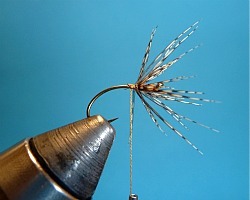 Not all traditional tenkara flies were reverse hackled, but many were and are to this day. The step-by-step sequence here shows such a fly, tied with a partridge feather for the hackle and Pearsall's Hot Orange Gossamer silk thread. I'll often use a brown feather for both the Partridge and Orange and the Partridge and Green, and a grey feather for the Partridge and Yellow and the Partridge and Red (which is not a standard pattern, but is and adaptation of Michael Hackney's favorite brookie fly, which uses a red thread body and grizzly hackle). 1. Start the thread at the eye and wrap back about 1/4 of the way to the bend. For a size 12 or 14 hook and Pearsall's Gossamer silk thread, I use 11 wraps. 2. Strip the fuzz off a partridge feather and tie it in on the top of the shank with the concave side up and the stem extending out over the hook bend. 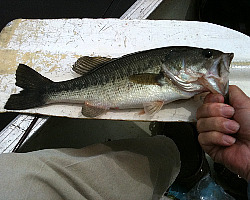 Do four or five wraps toward the hook eye, snip off the tip, and wrap to the hook eye. Then wrap back to the feather, lift the feather, and do about three wraps behind the feather. 3. Wrap the feather with each wrap just behind the previous wrap, being very careful to not trap any barbs with your wraps. After each wrap gently stroke the feather barbs forward. Unlike the North Country one to one and a half wraps, make three wraps for a partridge feather, three or four with a hen pheasant feather. Tie off with three or four thread wraps. 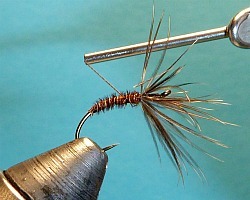 If you have wrapped the hackle properly, it should already have sufficient forward slant. 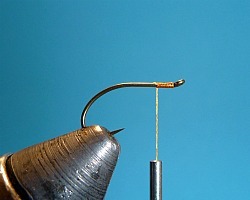 Tying it off often traps barbs on the wrong side of the thread (toward the bend). Clip these off. 4. I now tie in a collar of peacock herl, Takayama style. 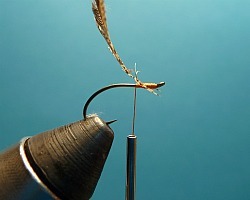 Take one herl (preferable from a Peacock Eyed Stick rather than strung herl) and holding it with both hands, catch the tying thread. 5. Lift the herl behind the hook and gradually place it on the top of the hook shank, with the tying thread just behind the hackle. 6. Make about four touching wraps with the thread to secure the herl. Wrap the herl about three times, then tie it down and clip off the herl on the bend side of the thread. 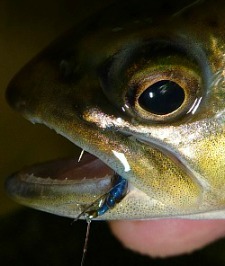 Photo shows fly tied on a Daiichi 1250 barbless hook. In addition to orange, which is perhaps the most popular "Partridge and ..." color, tie them also in yellow (which is an excellent imitation for sulfers), green (for any of the caddis species in which the pupae have green bodies), red (to see if Michael Hackney's favorite brookie fly becomes your favorite as well), and both peacock herl and pheasant tail because flies with those materials just seem to catch a lot of fish. I now tie the Takayama Sakasa Kebari with more peacock herl than shown in the step by step above. The photo just below and to the right (with the red body) is a better representation. Here's a short video shot by Lou DiGena a couple years ago. Yvon Chouinard wrote an article for Fly Fisherman magazine on the simplicity and effectiveness of a pheasant tail and partridge soft hackle, which he used as his only fly for a year. 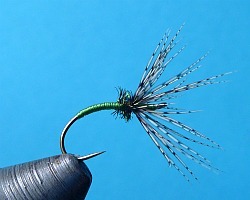 The fly also works quite nicely when tied as a sakasa kebari. 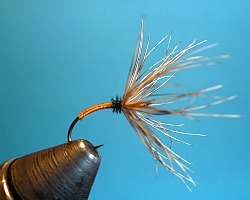 The fly shown here used hen pheasant for the hackle, but partridge is just as effective and much easier to obtain. 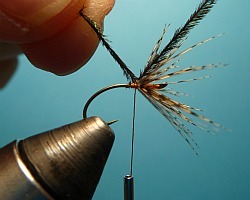 After starting the thread and winding on the hackle, advance the thread to the bend and tie in about 4 pheasant tail barbs, bring the thread back to just behind the hackle in touching turns, then wind the pheasant tail up to where you have left the thread. Tie off the pheasant tail, clip the tag ends, and then use your tying thread as a rib to reinforce the pheasant tail, winding in widely spaced turns back to the bend, just past the end of the pheasant tail wrappings. Tie a whip finish at the bend and you are done. Don't think they're just for trout. Bluegills can't get enough of 'em.